Life is breathed into the constitution through statutory enactments, judicial pronouncements and customs of practice developing over time; never by amendments. The later ought to be a remedy of last resort, to be applied as antidote where a provision fails to encapsulate the vagaries of time. Yet various constitutional amendment onslaughts have been mooted including changing the election date, MPs seeking powers to superintend the equalization fund, Council of Governors (COG) aiming to tinker with revenue allocation and CORD brigade lingering over potpourri of issues they are grappling to philosophize. Constitution provisions are intricately intertwined; tampering with one may cause ripple effects diluting harmonious functionality of entire instrument. Amendment should be applied as a research backed antidote for an issue proven to be unworkable, to ensure the document remains living as society grows and not on speculative permutations of futuristic impact. Conducting hasty mutilations may generate cumbersome results as witnessed by 1919 United States eighteenth amendment banning alcohol. A decade later the move would be reversed through another amendment. Proscribing alcohol was just impossible! This illustrates the danger amending a Constitution without comprehensive scrutiny. A closer case study is our independence Constitution reveals its vitality was militated by array of unconsidered amendments. Whereas the Constitution is a political document, restricting politicians from using it as a dashboard for their political chess game is a mission impossible. Referendum calls by Cord brigade maybe appreciated from those lenses. Their move being political requires political ripostes from naysayers. If they prevail, well, history will be defined, with victors being venerated and the vanquished being vilified. But pesa Mashinani calls by C.O.G clamoring more pie of revenue raised nationally is casual and baffling. Not only has COG not bothered to cost 14 functions allocated to them, they have failed to see the national government has 35 functions, some like education, national security and defense swallowing huge chunks of money. Not only has COG ignored inter-governmental mechanism to ventilate their issues, they will hear nothing of accountability at county level to facilitate prudent utilization of “meager” resources they have, hiding behind court injunctions wherever Senate moves to scrutinize them. The referendum pursuit by governors may not be about money after all, but a choreographed side-show to conceal ineptitude characterizing the institution that is Council of Governors. Under C.O.G watch, Counties are mere consumption, instead of being production units. National treasury is now like a lorry pulling 47 heavy cages attached to it. If each of the cages were able to propel itself, the speed of the lorry would be faster. Having financially functional counties is a path for growth of the national economy. Yet C.O.G has given a wide berth to enormous possibilities of raising revenue availed within the Constitutional and statutory framework. Even in raising revenue through county taxation, the Commission of Revenue allocation has lamented of counties being awful in utilizing this avenue, performing more dismally than the defunct local government authorities. The County Government Act and the Public Finance Management Act encourages counties to form corporations, enter into joint ventures and explore mechanism for Private Public partnership. Capital Markets Authority through its Capital Markets Master plan 2014 – 2023 is inviting counties to explore capital markets for financing especially on infrastructural projects. Unfortunately, as the Commission on Implementation of the Constitution assessment report on devolution, from steps to strides, reveals, most counties have no idea on how to raise revenue outside the national allocation. Inventiveness like one demonstrated by Murang’a County in their shilling kwa shilling initiative has been missing. These are the potentials C.O.G ought to be exploring and bringing into fruition through capacity building, thus facilitating the attainment of vision 2030. But the ideologically moribund C.O.G has narrowed their mandate to activism. Wherever faced with singular adversity, instead of rising to hallmarks of leadership, their move is predictable; blaming undisclosed gnomes of Harambee house for their predicaments. When will COG shape up any ideology? When will we see shreds of initiative and glimpses of prospects from them? What of value has ever come from the council? Their choice of fiery and militant governor, ever prepared for fisticuffs affray whenever counties are questioned is telling. Does this betray C.O.G as self-effacing club and not a hub of thought? We ought to see counties doing a peer review and benchmarking amongst themselves; devolution awards being given to the best performing counties; Kenyan “Olympics”, “world cup” and “county sevens” being held with counties as the participants. We cherish to see counties thinking big, being run away successes. COG on its volition, utilizing the corporate goodwill Kenya has, ought to be a house of wonder, pushing Kenya to higher heights. 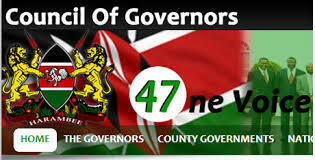 Current Governors are the founding fathers of County Governments; they ought to set the framework. Have these founding fathers turned into founding villains? It was permissible when forces of status quo were hell-bent to scuttle realization of devolution dream for Kenyans to stand up for Counties. But Baby devolution has grown and it’s now threatening to starve her mother. Is it now permissible for Kenyans to rise up and halt the devolution train from trampling upon the national government? The first amendment to will break our Constitutional virginity. Such amendment ought to be reached through mutual consensus and widespread agreement, not by assault. Invoking amendments option when other avenues are still nigh is being cruel in handling our treasured Constitution.